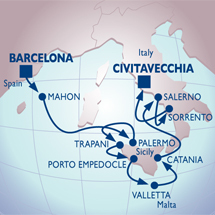 Azamara Cruise Barcelona to Rome Luxury Cruise October 16, 2012 begin your Mediterranean voyage in Barcelona great city of Spin before embarking on your cruise to Rome. Sail around Sicily and the Amalfi Coast before your Mediterranean cruise to Rome arrives. Fill out this form and we will get in touch with you shortly. If you book online all discounts will be applied and will be confirmed in the email confirmation we send.